Cunanan alone on the beach. The first episode of The Assassination of Gianni Versace soon comes to the matter of Versace’s (Edgar Ramírez) death and following it, the question of Andrew Cunanan’s (Darren Criss) motives . We jump back and forth from that event to Andrew ‘s prior encounter with the fashion mogul, taking place five years earlier in San Francisco. Versace ends up asking Andrew to attend an opera Versace himself is costuming. During this time with Versace at the opera house, Andrew tells the designer that he is writing a novel, inspired by his own ‘crazy’ family — Andrew wants to be seen by Versace as a creator, as ‘worthy’. Earlier, in another scene, we see the young man with a dozen or more magazines laid out on the floor, absorbing them all. We are to take from this Andrew has been studying his mark — getting to know Versace before he knows him. Andrew is supremely, preternaturally skilled at seeing inside of those around him, knowing what to appeal to and how to do it. It is akin to watching a predator stalking prey, whilst they remain completely unaware of the danger they are in. The opera that brings to two together is Andrew Strauss’s ‘Capriccio’, the word meaning, ‘a painting or other work of art representing a fantasy or a mixture of real and imaginary features.’ The part shown is the overture, the capstone to the last opera Strauss composed before his death. 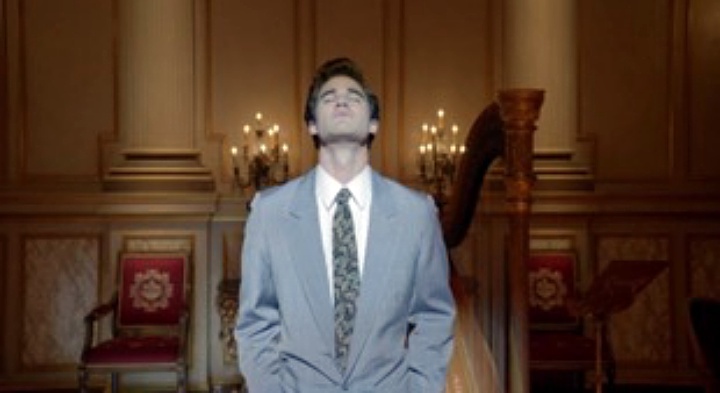 During the overture, Andrew shows true emotion (meaning it is occurs naturally, rather than a manufactured facet of who Andrew is at the time), crying openly and struggling to control himself. Capriccio is staged as an opera within an opera, a story within a story. We will see the stories within this huge opera and tragic spectacle of Versace’s death, just as with the O.J. Simpson trial and attendant show by the same creators. One of the final scenes of the opera sees a Countess — torn between two men — asking her own reflection in the mirror, “Is there anything that isn’t trivial?” Truly asking, ‘Does anything really matter?’ It is a question Andrew will have to ask himself, once his artificial selves fall away, leaving him alone to confront himself. What has this life of grandiose lies and deceit left him with, who is he really? The first five minutes of episode one spends time juxtaposing Andrew Cunanan and Gianni Versace. Versace is a man who has everything: a house emblazoned and adorned with his own creations, with staff and a partner and people around him. Everyone recognises him on the street, he has friends — he has a life. Andrew Cunanan is an isolated figure on a huge beach, ill, coming apart; he has no one and nothing. As we come to see, everything about him is a falsehood, a concoction and a lie. He is a different person for every audience. He has no trouble, admitting this to a friend ( or rather, someone who believes himself to be Andrew’s friend); he only tells people what they need to hear. What he doesn’t say — the truthful heart of the matter — is that he lies to get what he wants from people: respect, recognition, and to satisfy more material needs. The crux is that Andrew doesn’t see them as lies, because he truly is becoming another person. To him, there is the exterior person and if they are standing before you, they must exist, ergo, it is not a lie. This is not to say that Andrew is absolved morally of his outrageous, manipulative lies, it is more to show that he could easily lose himself amid the myriad personalities he creates for himself. Then, after the inevitable collapse of so much fiction, all Andrew is left with is his real self. The Assassination of Gianni Versace could be said, in large part, to be looking at who Andrew really is. Is he simply a serial killer, deprived of empathy by nature? A conman who has lost himself somewhere inside the stories and personalities of his own creation? Or, is he someone looking for something that he himself doesn’t understand? The truth may be lying somewhere scattered among all of these questions. During their talk at the opera house, Versace says he hopes people will get to know him by wearing his clothes, to understand him. He tells Andrew ‘People will get to know you a little bit when they read your book,’. This is one of the linchpin lines of the episode. It is telling us explicitly that we are engaged in a study of Andrew, that we might “get to know him a little bit”. Except it is not a book that Andrew authors, but something terrible. A character like Andrew — a person like Andrew Cunanan, whose motives and actions remain opaque to this day — can seem to us like an inscrutable cipher. Their actions are so reprehensible as to make understanding them seem impossible, and to attempt to do so repugnant to our sensibilities. Yet, we still try to do it, and The Assassination of Gianni Versace is another attempt to deconstruct something huge and to find its essence — to find out why. Andrew on stage at the opera house. All of this goes alongside themes of salacious mass media and celebrity culture. One grisly example shows a young man witness to the stricken Versace sprint to his car to retrieve a camera, eager to take a snap of the mortally wounded man. He then stands before assembled media crews, and starts an impromptu auction in the street, mere feet from the crime scene. Another scene sees previously-denied Versace autograph hunters press a Versace magazine Ad into Gianni’s pooled blood. Then, there were the global headlines announcing the fashion giant’s death, the reports and rumours about his private life, his health and potential pre-connection to his eventual killer. The other main plank of the episode pertains to the control of Versace’s legacy — business and personal. His sister – Donatella (Penolope Cruz) and brother Santo (Giovanni Cirfiera) — arrive to exert control over what the public and police find out about their brother. The victim of this is Verace’s long term boyfriend, Antonio (Ricky Martin). He has to face blundering, cold inquiries from a detective, who asks whether Antonio was paid for his relationship with Versace. He faces questions, asked in an offhand manner, that no wife or girlfriend would have to answer. Antonio is forced justify his relationship with Versace — 15 years long — hours after the death of his partner, still covered in his blood. Donatella treats Antonio no better, telling him he is to speak to no one without consulting her first. She shows no care for him in their shared time of grief, viewing him only as a potential embarrassment which must be suppressed. Ricky Martin as Antonio D’Amico. Matters then immediately turn to business and image. Donatella tells assembled lawyers that they (the press, the public) “judge the killer, yes, but they’ll judge the victim too. First, people weep, then they whisper.’ This is another key line in the episode, summing up the maelstrom of lurid tabloid headlines that followed Versace’s death. Donatella makes it clear that she views the perceived abasement of Versace’s image as akin to killing him twice. Donatella sees herself and assumes the mantle of a bulwark, taking her brother’s empire onto her shoulders. She rejects the forthcoming public offering Versace had arranged for his company, stressing the need to keep it in the hands of family, not strangers. Penelope Cruz as Donatella Versace. The episode ends with Andrew, strolling along the Miami beachfront, Versace sunglasses covering his eyes. He views racks of newspapers all bearing the news of Versace’s death, buying a clutch for himself. Andrew smiles as he takes it all in– he has created this. Something he has done created worldwide news, and recognition is finally his. It brings us back to the title of the episode, The Man Who Would be Vogue. This could be seen to be a double-edged play on the title of a book Andrew carries with him. We see him pull a copy out of his bag, alongside his gun. ‘he Man Who Was Vogue is a book about Conde Naste, a publishing magnate who found his fortune and establishing fame with the purchase of Vogue magazine in 1916. Over time, Naste positioned the magazine as a repository for style and elan, making it a byword for the new and the visionary. Andrew, through his actions, becomes a kind of monstrous vogue; his ‘work’ on the cover of every highbrow and lowbrow newspaper, tabloid and magazine. He is wanted nationwide, pursued by the police and FBI. He has finally found a way to create something fame-worthy, via the destruction of others.